This bath toy storage bag keeps your bathroom and bathtub clean and organised. Drain and dry toys quickly. The organiser has two strong suction cups to ensure firm attachment even when filled with heavy toys. 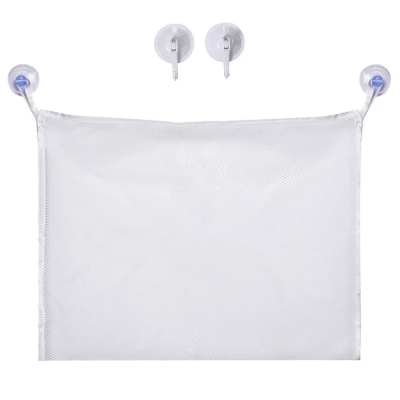 Two extra suction cups with hook are included for additional suction or to hang other bath accessories. Easy to attach and remove. No tools needed. Large size: 45 * 35 cm; Made of Dacron; Washable and durable. Suction cups adhere best to smooth and flat surfaces such as tile and glass. To ensure firm attachment, please clean the surface before pressing the suction cups. Make sure there are no air bubbles between the cup and the surface.